Research shows us that focusing predominantly on math learners’ ability to produce correct answers quickly, which is often the measure of success on standardized tests, may come at the expense of student confidence. Emphasizing rote learning is no longer thought to be the most effective way to guide students in building a solid foundation of sense-making ability, problem solving skills, independent reasoning, and deeper conceptual understanding. In the realm of elementary math instruction, the benefits of classroom discussion have been quite widely recognized. Now, authors of the recently-published professional learning program, Mathematics Discourse in Secondary Classrooms: A Practice-Based Resource for Professional Learning, (MDISC), Beth Herbel-Eisenmann, Michelle Cirillo, Michael D. Steele, Samuel Otten, and Kate R. Johnson address the need for an increase in rich discourse in secondary math classrooms, where the more traditional practices of homework review, teacher-driven lecture, and independent classwork are still common. 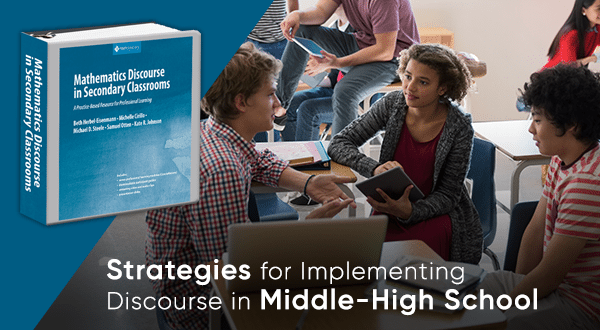 This new resource seeks not only to advocate for math discourse in the secondary grades, but also to broaden the traditional definition of discourse, beyond that of verbal discussion, to include any action we use to communicate: speaking, writing, drawing, use of symbols or other representations, use of gestures, and other nonverbal forms of communication. Attentive listening could certainly fall under this description as well, and is perhaps one of the most powerful and profound tools that teachers have at their disposal. Through listening closely to a student’s perceptions, a teacher can gain invaluable insights into what that student understands, believes about his or her own math ability, and finds challenging. Powerful discourse is defined as, “discourse that positions students as people who are capable of making sense of mathematics and supports students’ developing identities in terms of status, smartness, and competence in mathematics class.” They also provide to teachers a set of discourse-related tools called Teacher Discourse Moves, (TDMs), modified from the Talk Moves described by Chapin, O’Connor, and Anderson, 2009). Integral to this practice-based, mathematics discourse approach is the critical matter of equity in students’ experiences as learners. Drawing from both sociolinguistics and socio-psychology research, the findings help us understand that the ways in which teachers and students engage in discourse significantly impact not only a student’s learning of mathematical content, but equally important, that student’s sense of identity as a math learner. The authors explain that “positioning” in the math classroom refers to “the ways in which people use action and speech to arrange social structures”, and that students can unwittingly assume a higher or lower status or rank within the classroom with respect to their math skills, depending on verbal or nonverbal messages that are communicated in a variety of ways. The heightened awareness that we all must strive to develop regarding how we communicate with students, and how our messages may be interpreted, is well worth the effort and the self-examination required. Herbel-Eisenmann et al. 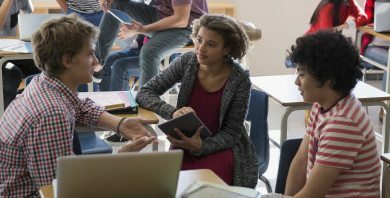 describe how our biases may cause us to inadvertently contribute to unintentional stereotyping and lead to lowered expectations and diminished student engagement, but conversely, how harnessing the power of discourse can give those same learners the tools to see themselves as capable mathematicians.